Hailey and Dustin knew they wanted to buy a home. With a little assistance, they are now paying into their equity, not paying for rent. 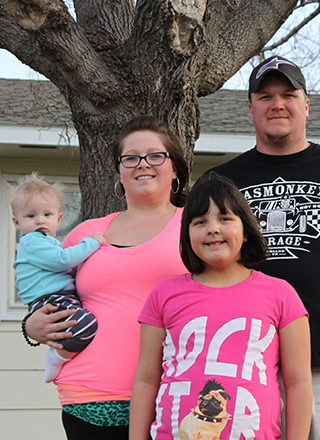 The family moved to Montana in July 2012 from a small paper mill town in Minnesota that had recently had huge lay-offs. After graduating from college, they packed a U-Haul, and a vacation turned into a move. With no hotels available, they set up camp at a KOA for more than 30 days. Hailey and Dustin enrolled in the Assets for Independence (AFI) program. The AFI program is a matched savings program. For each $1 you save, HRDC matches it with $4. When you reach your savings target, HRDC helps you use these funds to purchase your new asset. While in the savings program, you also complete a range of personal finance activities to learn how to better manage your money. The matched savings can be used for buying a home, paying for post-secondary education or training, or starting or expanding a small business. Hailey and Dustin’s future plans for their new house include finishing the basement, re-siding, and putting up a new fence.